Lions Gate Entertainment Corp. (USA) (LGF): Are Hedge Funds Right To Abandon This Stock? Looking for high-potential stocks? Just follow the big players within the hedge fund industry. Why should you do so? Let’s take a brief look at what statistics have to say about hedge funds’ stock picking abilities to illustrate. The Standard and Poor’s 500 Index returned approximately 7.6% in the 12 months ending November 21, with more than 51% of the stocks in the index failing to beat the benchmark. Therefore, the odds that one will pin down a winner by randomly picking a stock are less than the odds in a fair coin-tossing game. Conversely, best performing hedge funds’ 30 preferred mid-cap stocks generated a return of 18% during the same 12-month period. Coincidence? It might happen to be so, but it is unlikely. Our research covering a 17-year period indicates that hedge funds’ stock picks generate superior risk-adjusted returns. That’s why we believe it is wise to check hedge fund activity before you invest your time or your savings on a stock like Lions Gate Entertainment Corp. (USA) (NYSE:LGF). Lions Gate Entertainment Corp. (USA) (NYSE:LGF) investors should pay attention to a stark decrease in enthusiasm from smart money of late. LGF was in 28 hedge funds’ portfolios at the end of September. 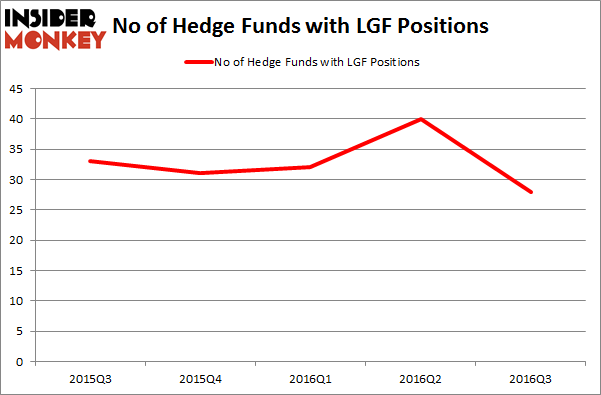 There were 40 hedge funds in our database with LGF positions at the end of the previous quarter. At the end of this article we will also compare LGF to other stocks including NuVasive, Inc. (NASDAQ:NUVA), Two Harbors Investment Corp (NYSE:TWO), and Black Stone Minerals LP (NYSE:BSM) to get a better sense of its popularity. 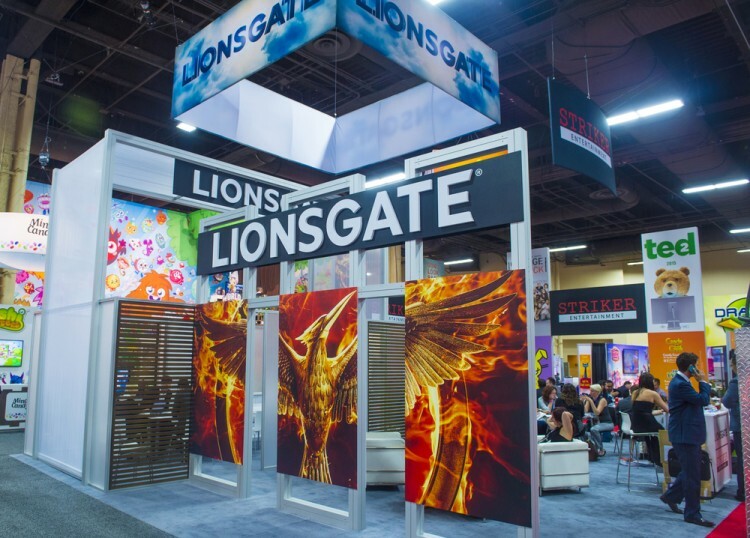 With all of this in mind, we’re going to take a glance at the new action surrounding Lions Gate Entertainment Corp. (USA) (NYSE:LGF). What does the smart money think about Lions Gate Entertainment Corp. (USA) (NYSE:LGF)? Heading into the fourth quarter of 2016, a total of 28 of the hedge funds tracked by Insider Monkey held long positions in this stock, a 30% drop from the previous quarter. That fall dropped hedge fund ownership of Lions Gate to its lowest level in the last year. With hedge funds’ positions undergoing their usual ebb and flow, there exists a select group of key hedge fund managers who were upping their stakes substantially (or already accumulated large positions). According to publicly available hedge fund and institutional investor holdings data compiled by Insider Monkey, Mark Rachesky’s MHR Fund Management has the biggest position in Lions Gate Entertainment Corp. (USA) (NYSE:LGF), worth close to $603.9 million, accounting for 42.7% of its total 13F portfolio. The second most bullish fund manager is Citadel Investment Group, managed by Ken Griffin, which holds a $88.4 million position. Some other professional money managers with similar optimism consist of Eric Bannasch’s Cadian Capital, Curtis Macnguyen’s Ivory Capital (Investment Mgmt) and David Goel and Paul Ferri’s Matrix Capital Management. What Hedge Funds Tell Us About Splunk Inc (SPLK) What Explains the Huge Jump in Louisiana-Pacific Corporation (LPX)’s... Is DENTSPLY International Inc. (XRAY) A Good Stock To Buy? Is Lear Corporation (LEA) A Good Stock To Buy? Total System Services, Inc. (TSS): Are Hedge Funds Right About This Stock? Has Mallinckrodt PLC (MNK) Turned the Corner?